The AGR Cartomizer Tank by Youde has been around for a while for a reason - it is a very user-friendly tank, designed for use with Boge cartomizers (standard and XXL sizes), but will work with Smok standard and XL cartomizerswithout a flange. The AGR features polished stainless steel construction and polycarbonate tank tubes, a locking base and hassle-free re-filling! 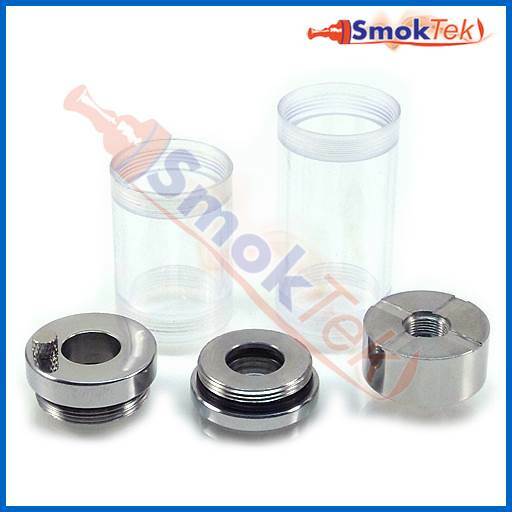 Each unit includes one short and one long polycarbonate tube, stainless top and bottom caps, and a separate locking base. The locking base ensures that your Boge carto stays in place and will not slip out. To use the base, assemble the AGR with a cartomizer, screw the locking base onto your APV, screw your assembled AGR into the locking base and you are ready to vape! The AGR is very easy to fill: simply unscrew the knurled knob on the top cap and fill using a needle-tip bottle. We recommend that you use pre-punched Boge cartomizers with the AGR or punch your own using a cartomizer hole punch. Please note that we do not suggest use of the AGR with the black Boges or Smok cartomizers: the extra layer of vinyl wrapping renders them too wide for the AGR. Please remove the vinyl wrapping to use with the AGR. 808-threaded Boges will NOT work with the AGR either.